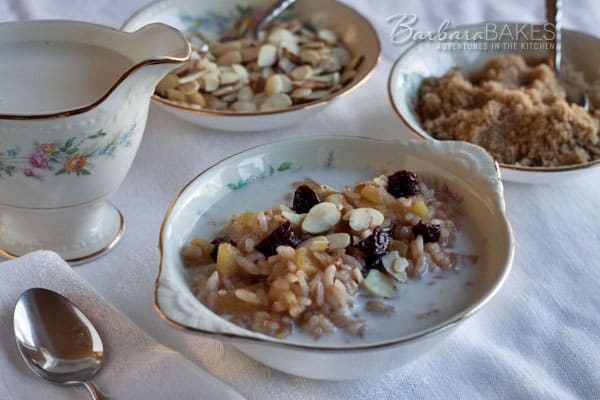 A lightly sweetened risotto loaded with apples and dried cherries. A delightful way to start the day, and it’s ready in under 15 minutes when you make it in the pressure cooker. Kalyn, Kalyn’s Kitchen, also blogs at Slow Cooker from Scratch. She recently posted a recipe roundup – 20 Delicious Slow Cooker Breakfast Recipes from Food Bloggers. All 20 recipes looked delicious, but it was the Crockpot Breakfast Risotto from A Year of Slow Cooking that I decided I wanted to try first. An Instant Pot is one of the most popular brands of electric pressure cookers. 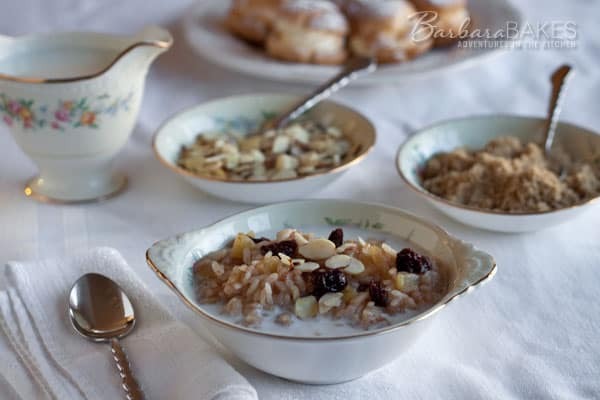 They are easy to use and your Instant Pot can help you create this delicious Apple Cherry Breakfast Risotto! Slow cooker recipes are generally easy to convert to pressure cooker recipes. Making risotto in the pressure cooker is so much easier than on the stove top, and it’s still creamy and delicious. I used 1% milk so it would be lower in fat and calories, but you could certainly stir in a little cream after it was cooked to make it ever more creamy and delicious. I knew I’d love having risotto for breakfast, but I was a little unsure how my family would react. I’m happy to report that everyone liked it and most, including me, helped themselves to seconds. Heat the butter in the pressure cooker pot for 2 to 3 minutes. Stir in the rice and cook, stirring frequently, until rice becomes opaque, about 3 to 4 minutes. Add the apples, spices, and brown sugar. Stir in the juice and milk. Select High Pressure and 6 minutes cook time. After 6 minutes, turn off pressure cooker and use a quick pressure release. Carefully remove pressure cooker lid and stir in dried cherries. Serve topped with additional brown sugar, sliced almonds and a splash of milk. This turned out really well, even when I substituted almond milk for the regular. So decadent it ought to be dessert! So great to hear – thanks Megan! Not a lot of people try this one, but I love it too. This looks delicious Barbara. I haven’t mustered the nerve to try cooking rice in my stove top pressure cooker yet. This just may be the recipe that pushes me to do it. That’s my kind of breakfast! I knew you would be able to make this in the pressure cooker and it looks fantastic! And thanks for the shout-out for Slow Cooker from Scratch; always appreciated!